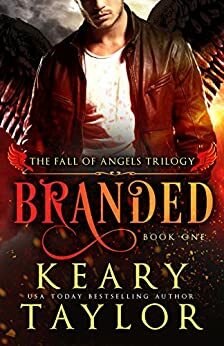 Join the ONE MILLION readers who have fallen hard for Branded: Fall of Angels! On the remote shores of Lake Samish hides a woman losing touch with reality. Haunted by violent dreams of angels, standing judgment for the sins of others, Jessica has resorted to a life of solitude and nightmares. But when two men she can’t ignore enter her life, everything changes, including the afterlife that calls to her. Can she hide the physical scars that follow her into the land of the living from the enigmatic and easygoing Alex? And why is her gorgeous and assertive new neighbor, Cole, so fascinated with her? A chance at love sits within reach, but the clock is ticking, and it might not be long until Jessica stands her own judgment and becomes the object of her greatest fear. Featured in THE WALL STREET JOURNAL as a "Self-Published Big Seller." The entire series is now available! Keary Taylor lives on Orcas Island in Washington State with her husband and their two children. 4.0 out of 5 starsWhat if.....? This book is certainly different from what I was expecting. But in saying that I loved this book. It did take me a little while to get in to it but once I did I totally enjoyed it. The blurb doesn't do this book justice!!! It was one hell of a read and I hope everyone reads this and is convinced because you can't pass it up. Wasn't at all what I expected and I'm glad I stuck it out. READ THIS BOOK! Enjoyed this book - good story and well written.